Imagine what you most want, or wanted, something that consumed you as a defining quest in your life. Picture slogging through the thankless early stages of the pursuit. Then willing the vague vision into a tangible possibility. And finally taking it to the cusp of tantalizing reality. Then think of it drizzling through your hands at least in part because of your own negligence. If you’re a man prone to extremes like Lenexa’s Lenroy Cameron Thompson, whose crusade to box in the 2012 London Olympics was punctured by his failure to be available for three drug tests in an 18-month period, devastation and depression would be delivered with the one-year suspension. Never mind that USA Boxing said then and confirms now that it has no belief he was trying to elude testing. Never mind that he says two of the times he was unable to be reached he was competing in Azerbaijan, where even as he missed the summons by the U.S. Anti-Doping Agency he was passing an on-site drug test. Four precious years of all-absorbing dedication to the sport in pursuit of the Olympics were vaporized and his identity stigmatized. Grieving after his lost appeal a few months before he could have been bound for London, Thompson briefly fended off an urge to stop at a liquor store and start drinking heavily. Then he indulged the idea for months. The habit turned into a routine and isolating ritual. Almost nightly, he’d seal his iPhone in a Ziploc bag and jump the fence to the pool in his apartment complex. Then he’d listen to music and swig wine in his floatie into the wee hours. He was so adrift he’d drink more when he’d go in. Between that and gorging himself on fast food, suddenly a two-time U.S. super heavyweight boxing champ who had gotten into the sport to lose weight blimped up 60-plus pounds to about 280. 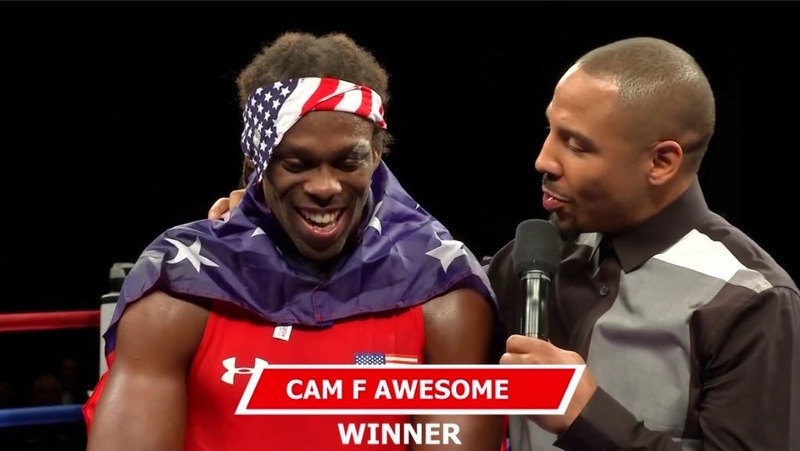 Now, he is Cam F. Awesome, a 27-year-old sculpted vegan who fights in the 201-pound (heavyweight) division. Now, he always makes sure his cell phone is charged so he can be available at all times for drug-testing officials whom he texts virtually his every move, anyway — as he illustrates on his phone by scrolling and scrolling and scrolling through texts to USADA. Now, by virtue of winning the U.S. Olympic Boxing Team Trials last week in Reno, he is on trajectory to the 2016 Rio Olympics. And he’d happily wear an ankle bracelet monitor or have an app put on his phone that makes him traceable at all times to make sure nothing goes awry this time. To complete his qualification, Awesome must place in the top three at the Americas qualifier in March in Argentina or win one of two other qualifying events — a baseline he sees as little more than a formality. Now, he is a new man, he’ll tell you, and he means it about as literally as anyone could. For one thing, spurred in part by a bet that compelled him to try the vegan 28-day challenge, Lenroy Cameron Thompson had to go. So since Feb. 16, 2013, his half-birthday, he’s been, well, Awesome. Since most people already called him by his middle name, Cam, he figured that was worth keeping. As for the Awesome part? Well, he simply couldn’t think of a better last name. “It was like a rebirth,” said Awesome, who grew up in Uniondale, N.Y., and moved to Florida when his parents retired there. Part of his rebirth was enabled by the uninterrupted support of people like friend-for-life Matt Mays and others in his life he considers family and Turner Boxing Academy’s John Brown. The lauded coach who tutored Tommy Morrison brought Awesome to the area from Florida to train after seeing promise in him he was only trying to trick himself into having then. Part of his resurgence no doubt came from embracing the vegan life, with the counsel of Bill and Ami Mackey. It’s a way of life he endorses and says makes him feel like a car with a fresh oil change but doesn’t want to preach about, either. “Those are the vegans who make the rest of us look bad,” he said. And just maybe part of his revival came from finding therapeutic footing in another outlet. As a comedian, which reminded him of his “addiction to attention” as he was making his way out of seclusion. One night, he wandered with a friend to a local open mike night. Then that started becoming a habit. Next thing you know, without telling anyone he knew, he was on stage himself at Stanford’s Legends location. After a few more performances, he felt comfortable enough to ask friends to attend. He drank a lot before the show, though, leaving him both bombed and bombing. “It was so bad … from what I’ve been told,” he said. Between the call to veganism and the realization he performed better sober — “who would have thought?” he said, laughing — and the end of his suspension nearing, a new outlook enabled Awesome to curtail his drinking. In some way, that’s all stayed connected. Even as his boxing life has been resuscitated, he’s more and more visible as a comedian, having performed everywhere from Los Angeles to Omaha to Dallas and regularly roaming to open mikes in the Kansas City area. He’s refined his act some since his vulgar start, he says, calling it “a lot more tasteful” but noting it’s “not 100 percent” politically correct … as you can see in an off-color schtick on YouTube. About the only thing he avoids is … anything self-deprecating. That would contradict being Awesome, after all, and the self-proclaimed “Taylor Swift of boxing” has the engaging personality to back that up. “All I want to do is love, be loved and punch people in the face,” he said, allowing as how he only meant the latter part in the ring. He doesn’t really want to be known as the boxing comedian, exactly, but it’s hard to avoid. And not just because his comedy is entwined with his boxing. For stress relief, Awesome typically performs routines in cities where he’s competing, just as he did a few nights before competition in Reno last week. Neither of these two passions pay much, especially since he lost all sponsorship income after his suspension. Awesome gets a modest monthly stipend from USA Boxing, and he might get a few bucks for a comedy gig. He also can make some money sparring, which helps explain both why he’ll frequently travel to get that work and why he’ll drive anywhere within a 12-hour radius. “I’ve mastered the art of living in my car,” he said, noting he’s apt to cook meals for the week, keep containers of food in a cooler in the car and then microwave them at gas stations as he travels. If he went pro, of course, he could sustain himself much more easily. But the thing is there’s something he wants more than anything else, something worth coming back for through the humiliation of four years ago, something that makes him say now that the rules are stupid but that he’ll make sure he’s on board with them. So if USADA knocks at his door at 7 a.m., again at 7:03 and calls at 7:05, you can be sure he’ll answer or get back there within the next 55 minutes he has to be tested. So if he’s flying to Puerto Rico for a competition, you can know he’ll be texting USADA to say he’s en route and that he’ll follow up with his room number as soon as he checks into the hotel. All because he wants to go to the Olympics, wants to earn the right to have the rings tattooed on his right forearm so for the rest of his life people will see it when they shake his hand. Because he knows now that the suspension did him good, that maybe things really do happen for a reason. Because he wants this so bad that he’s scared of the void that awaits once he completes the chase. After finding hope was there all along.